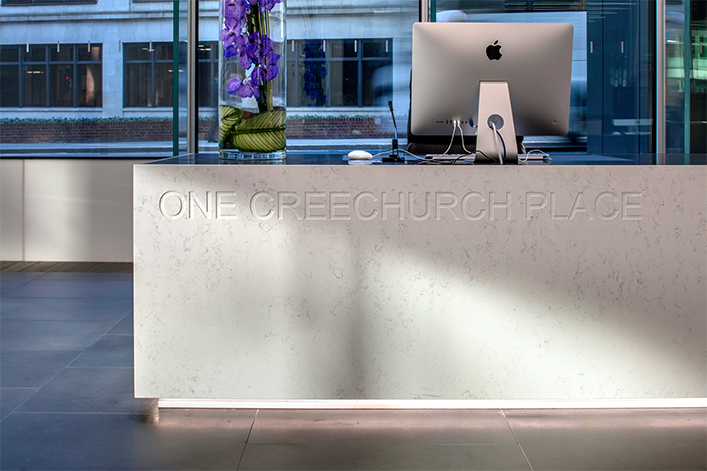 One Creechurch Place provides the City with 272,500 sq ft of office space over 17 floors, with excellent natural lighting and stunning views across the City. We completed the WC fit out works to all floors, with large locker and shower areas in the Basement, encompassing raised floors, drylined walls and ceilings, high gloss laminate duct panels, American black walnut cubicle fronts, porcelain floor tiling, natural slate vanity tops, mirrors, sanitaryware accessories, and final decoration. The joinery package included all timber and metal doorsets and ironmongery, skirting and a bespoke reception desk clad in natural stone.